All beaches in Malta, Gozo and Comino Islands are excellent and offer you a great opportunity of truly enjoying Mediterranean Sun during your holidays. You have three islands to explore and find out your favorite beach in Malta Island, Gozo Island and the smaller one called Comino Island. Ghajn Tuffieha Beach: You’ll find it next to Golden Bay, in the northwest of Malta, near Mgarr. It’s one of Malta’s most popular beaches. Some people will keep away from Ghajn Tuffieah because of the 180 steps to get there and the strong currents but that will also provide you with a more quiet place. Water sports are up, specially surfing. This beach is all about a rural environment, with nice tamarisk, samphire and acacia on the sand. Usually there aren’t many people, then stay for the sunsets, looking due west across the waves. Food and drink can only be bought from roving vendors or a little kiosk in the car park. Paradise Bay Beach: Located on a small natural cove in the north of Malta, close to Cirkewwa, near the ferry to Gozo island. This beach usually has young Maltese people because it is the ideal place for snorkeling and parties are held on weekends. There is a Diving School near the Paradise Bay Resort Hotel where you have PADI diving courses available all year round. Mellieha Bay Beach (or Ghadira Bay): It is near the town of Mellieha. This is the longest beach in Malta and the waters are shallow, which makes it an excellent place to let your children play while you rest. Facilities include rented lounges, deck chairs and sunshades. You can also practise sports like water skiing, windsurfing, canoeing and parasailing. Cafes and restaurants are great spots to look at the views. Fomm Ir-Rih Bay Beach: Located in the northeast of the island, near Mgarr, this is the best beach in Malta for people who don’t like crowds. But the privacy and room will cost you a 15/20-minute walk through a bit dangerous and sometimes steep pathway down. And then you will have to come back up… There are no facilities on the beach but the snorkeling is great. Pretty Bay: This is the main sandy beach in Birzebbugia, in the southeast of Malta. This has been a popular beach for the Maltese for decades. 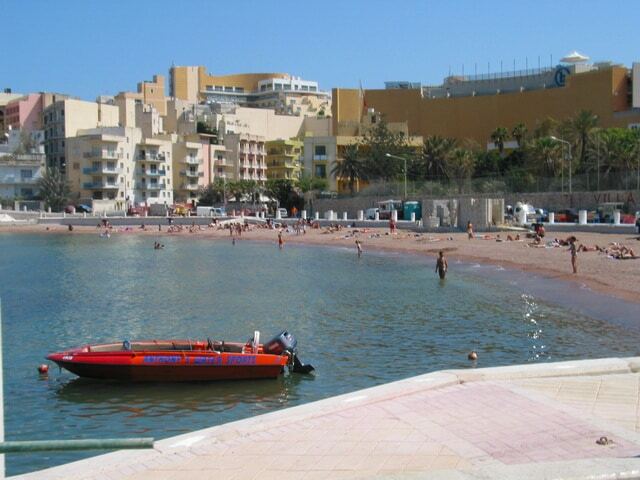 Being in the town seafront, there are lots of facilities and places to eat. Children will have a great time on the playground or the football field. Before or after enjoying the beach, take a time to explore the town of Birzebbugia and the historic temples and caves nearby. Ramla Bay Beach: Located on the northeast part of Gozo Island, this 500 meters stretch of beautiful beach with red sand offers sparkle turquoise waters and an amazing surrounding landscape and tamarisk trees where you can really feel you are in the middle of the Mediterranean Sea. 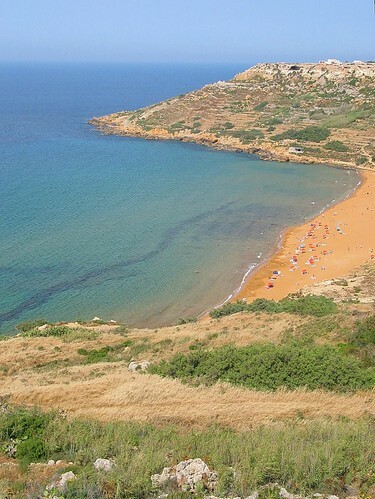 Ramla Bay Beach is considered the best beach in Gozo, so expect to find a lot of people there during summer. The snack bar and kiosks are only open in this season. Dwejra Bay Beach: This is a small pebble beach near high cliffs, located on the west coast of Gozo. The sea here attracts divers from around the world to visit sites like the Chimney and the Blue Hole. Snorkeling is also a great activity, specially in the Inland Sea if you enter the tunnel to get there. Another amazing experience in Dwejra Bay Beach is just hiking around to see spots like the Azure Window or Fungus Rock (a limestone islet covered with a brown plant which the Knights of St John thought to have medicinal properties in the 18th century). Gozo is a really small island. So, riding to this beach with a rented bike is great fun. There are only some kiosks in the car park for you to eat or drink something but you can also get up the hill to the beautiful Kempinski Hotel San Lawrenz, a not too expensive five star resort with Ayurvedic spa treatments. San Blas Bay Beach: Located not far from Nadur, in the northeast of Gozo, near the most beautiful valleys of the island. It has red sand like Ramla Beach, and it is very peaceful because the final part of the road is closed to traffic and you’ll have to walk for a while. Snorkeling, rented canoes and picnics are a must here but you can also rent umbrellas and sun beds. The kiosk sells drinks and snacks too. Blue Lagoon Beach: Boats are the only way to get to what can be considered one of the best beaches in Malta. It really doesn’t have any sand on the beach but on the bottom of the sea. The incredibly blue/green water is shallow and perfect for kids and adults to play and snorkel. There are no facilities here. Bring your own food and drink. There’s a whole page dedicated to Blue Lagoon Beach in this Malta Travel Guide. 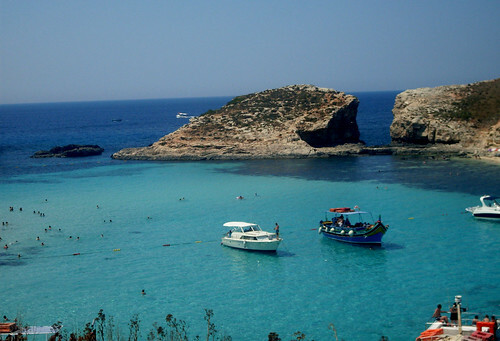 San Niklaw Bay Beach: Two small sandy coves reserved for Comino Hotel, the only one in the island, during summer. Santa Marijia Bay Beach: A small sandy beach good for families. Facilities are the ones in Comino Hotel.